The sky’s the limit in Apples to ApplesTM Freestyle game! 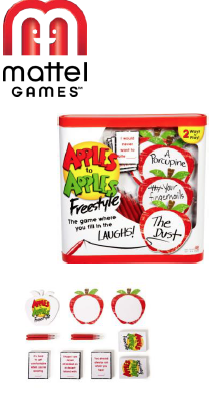 Branching out from classic Apples to Apples® game play, Apples to ApplesTM Freestyle introduces a whole new kind of creative fun – players get to make up their own hilarious answers! Each round, a different player is the “judge” and turns over a card to reveal a fill-in-the-blank statement. Everyone else comes up with a word or phrase to fill in that blank and writes it down on their personal apple slate – and what they choose to write can be as crazy as they want it to be! The judge selects the best answer and decides the winner of that round. First player to win 4 rounds wins the game! Offering customization, creativity, and constant laughter, Apples to ApplesTM Freestyle game is perfect for the whole family! Includes 216 cards, 5 writing slates, 5 dry-erase markers and instructions. Colors and decorations may vary. 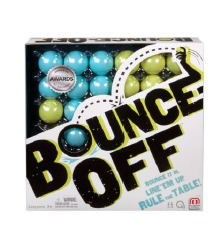 Ready for a Bounce-OffTM? It’s the ultimate head-to- head competition game for young adults and families. Flip over a challenge card to determine the pattern. Then, race to recreate the pattern by bouncing balls into the grid. The first to complete the pattern wins the card and the first to earn 3 cards wins the game. Includes 9 challenge cards, 16 balls and a game grid. For 2-4 players. Ages 7 and older. Find it first, find it fast, find your fun! 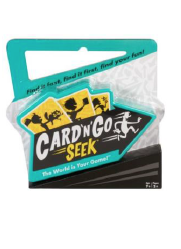 Card ‘N’ Go SeekTM is the game that delivers get-out-of-your-seat scavenger hunt fun for the whole family! At the count of three, everyone dashes off to retrieve an item revealed on one of the cards. The first player to get back with the correct type of item wins the matching card! Players have fun deciding for themselves what the cards mean. For example, finding something SWEET could be a lollipop or a picture of your great aunt Helen! Interpreting the cards really lets your personality shine. The first player to win one card of each color OR three cards of the same color wins the game! Every new environment invites new ways to play – the world is your game! Includes 150 cards, portable plastic case and instructions. Colors and decorations may vary. 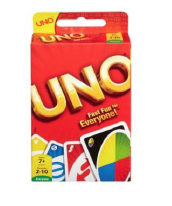 It’s the fast-moving card and party game that provides instant fun for four to eight players! It's as easy as "comparing apples to apples" -- just deal the cards and you're ready to play! And now, Red Apple cards come to life with pictures from Disney theme parks, movies, and Disney Channel shows. Watch out for the Poison Apple card! 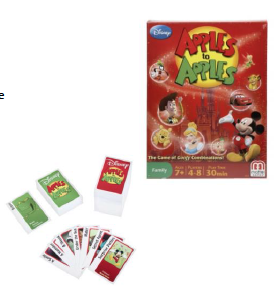 It’s available only in this Disney Apples to Apples®, and it will turn the game upside down! Ker Plunk® is a blast from the past with a cool look and attitude! The object of the game is to skillfully remove the sticks from the tube while dropping the fewest marbles possible. The translucent tube stands upright on a base that contains four separate numbered trays. Each player selects a numbered compartment to use throughout the game, and the straws are passed through holes midway of the tube to form a lattice "web.” The marbles are then placed in the top of the tube and held in place by the web. Just set it up, start playing and watch out for marbles that go “Ker Plunk!” The players must use steady hands and a cool head to remove the sticks from below the marbles. This best game from yester-year is just as much fun today! Share your great memories or start new ones! 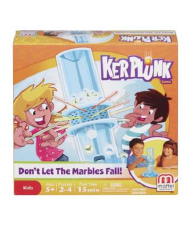 You and your friends will have a blast playing Ker Plunk®, just don’t let the marbles fall! 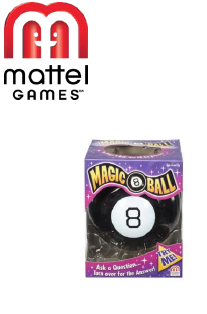 Magic 8 Ball® has the answers to all life’s questions! Ask anything you want, then turn it over and your answer’s in the window! Build, learn, and discover the alphabet! Learning the alphabet is fun when your little one starts building with 40 award-winning blocks decorated with the letters A through Z! Learn to recognize different letters, remember the alphabet, or practice basic spelling skills, building academics and fine motor skills as you play. 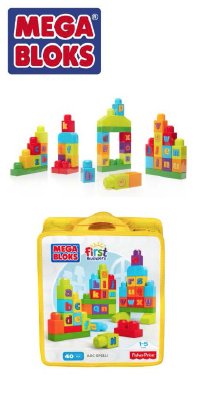 Stack the blocks, line them up to make words, or combine them with the special shapes to create anything you imagine! When playtime's over, cleanup is easy with the handy storage bag. The beloved game of quick sketches and hilarious guesses features three innovative, new ways to play! Includes a large group display so that everyone can see, stand, timer, and pen. 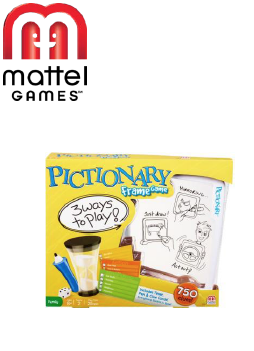 With 750 clues, game play can go on and on and the guesses can be just as hilarious as the sketches! For 3 or more players. 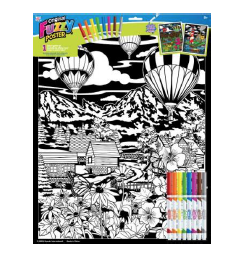 Become an artist and color your own masterpiece with the Original Fuzzy Poster® by RoseArt® posters. Assorted whimsical and fun designs are included in our 16"x20" Fuzzy Poster Assortment. Perfect projects to display proudly on your wall when complete. The goof proof design helps you color in the lines so you can have brilliant art every time! Markers Included. Ages 8 and older. 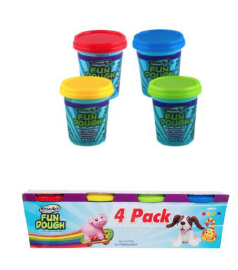 Fun Dough Modeling Compound in an assortment of primary colors Key Features 4-5oz tubs of primary colored modeling compound. Watch your child’s face light up – with RoseArt’s Lightastic Pop Art LED Light Pad! 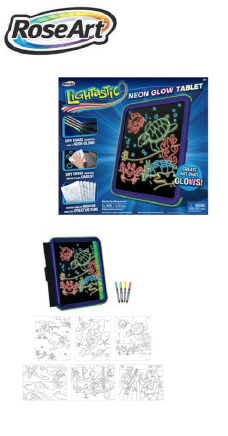 This ultra-illuminating Pop Art Light Pad comes with a double-ended popping tool and numerous design sheets that allow kids to create colorful designs that light up. It also comes with a removable easel so they can show off their masterpieces. Use with any standard 8.5” x 11” paper. Box includes pop art popping tool, 3 color design sheets, 3 foam sheets, 12 blank design sheets, 12 pre-printed design sheets and an easy to use instruction sheet. Batteries not included. Requires 3 AA batteries. Contains 108 cards and instructions. For 2 to 10 players.